The son of a garage owner from Rotherham, Trevor Taylor made his mark in Formula 3, securing the championship in 1958 and moving to Formula 2 in 1959. 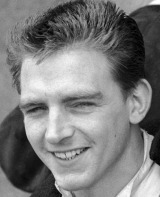 In 1960 he won the Formula Junior title, as well as doing some racing for Team Lotus. In 1961 he retained his title, and an injury to Innes Ireland that gave him his Formula One break, driving alongside Jim Clark. At the end of the year he went with Clark to South Africa for four non-championship races - he finished second in the first, crashed in the second, retired in the third and then won the fourth. Unfortunately, accidents, many in which he was blameless, were to blight his career. In 1962 he opened the season with a second place in the Dutch Grand Prix but otherwise his returns were indifferent, and he survived a big crash at Spa. In non-championship races he underlined his potential with wins in the Mexican and South African grand prix. A sixth-place finish in Monaco opened his 1963 season, but yet again he failed to capitalise while team-mate Clark romped to the world title. In 1964, replaced at Lotus by Peter Arundell, he moved to the British Racing partnership but he took on an underperforming car. His only point of the season came at the USA Grand Prix when he was the sixth and last finisher. That season he also ran his own touring car team, Aurora Gear Racing, with his sister, and in 1965, without an F1 drive, he competed in F2 in a Brabham. By then he had committed to touring cars, although he made a final and fleeting F1 outing at the British Grand Prix in 1966. The following season he won the Tourist Trophy in a Lola T70 and ended his career as a leading Formula 5000 driver before retiring in 1972. He always raced with a yellow helmet and overalls and was widely credited as the originator of the yellow stripe down the middle of Team Lotus racing cars as a result of officials at the Indianapolis 500 objecting to all-green cars on Lotus's arrival at the Brickyard in 1963.